DENVER – Gee, I survived almost too-much-fun Friday night at Row 14, waded through the 1,500 or so wine enthusiasts that kindly showed up for the third annual Colorado Urban Winefest on Saturday (where I paired a grilled PBJ with smoked bacon on whole wheat with a Boulder Creek 2010 Cabernet Franc) and then took a serious stumble Monday when I screwed up misstated the facts in my column for my real job at the The Daily Sentinel. Arrgghh, as pirates would say. I got confused, or distracted, or just simply wasn’t being mindful. Fortunately, you don’t have to see the crash, although there are a few readers in Grand Junction and elsewhere who this morning are mightily surprised to find out several winemakers have moved to new digs, courtesy of my writing. So, ugh, let’s move on, shall we? Overall, Colorado Urban Winefest continues to improve with age, not unlike the Colorado wine industry itself. Final attendance numbers for Saturday’s third annual Colorado Urban Winefest presented by Westminster Total Beverage came out Monday and indicated around 1,500 wine enthusiasts showed up Saturday at Infinity Park in Glendale. When I spied Kyle Schlachter of the Colorado Wine Industry Development Board schlepping a bit of lunch through Saturday’s crowd, he mentioned strong last-minute tickets sales and healthy walk-up traffic as contributing to the pleasant turn-out. “I’m really happy with the turnout ,” said Cassidee Schull, director of the Colorado Association for Viticulture and Enology and it seems everyone else was, also. It’s also likely the temperate weather (unlike 2012 when the thermometer was topping out at around 102) – Saturday’s mix of sun and clouds with a cool breeze along with the extensive acres of grass fields – kept fest-goers and winery representatives comfortable all afternoon. Among the selections Thompson was pouring was the Boulder Creek 2011 Colorado Dry Rosé, which Friday was one of the dry rosés competing for the Governor’s Cup Wine Competition. Many people familiar with rosé automatically drift away from what they think will be something sweet but a recent trend among Colorado winemakers (Canyon Wind Cellars and Garfield Estates also offer dry rosés) to produce a dry rosé with great fruit has revived interest in the wine. “It takes a little education, and you have to get them to taste it, but once you do, it’s really popular,” Thompson said. The winemaker is his wife, Jackie Thompson, whose wines always show well in competitions. The competition must have been close, but the 47-Ten 2012 Grand Valley Rosé from Canyon Wind Cellars was named Best Rosé at the Governor’s Cup. 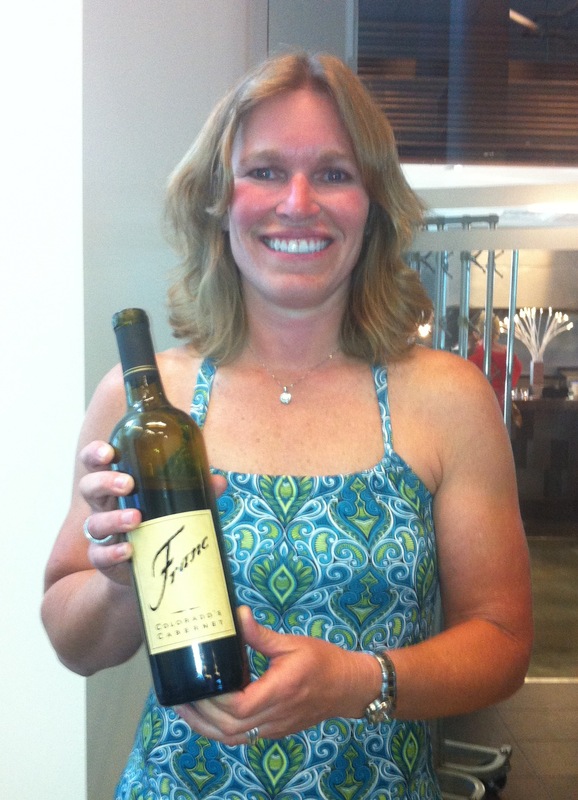 Jay and Jennifer Christianson of Canyon Wind Cellars also won a Double Gold for their 2010 Grand Valley Petit Verdot. Michelle Cleveland of Creekside Cellars also produces a delightful dry rosé but it’s light-gold in color, similar to a pinot grigio. I wasn’t able to talk with her during Saturday’s crush of people but will get back to you on that item. As we mentioned Sunday, Michelle was the winner of the Governor’s Cup Wine Competition with her 2010 Grand Valley Cabernet Franc, which I diligently paired with that grilled PB&J with smoked bacon on whole-grain wheat. Highly recommended. Around 225 wines were judged by the tasting panel of experts including restaurateurs, sommeliers, writers and chefs, most of whom seemed quite pleased with their task. “They showed tremendous excitement over all the Bordeaux red grapes produced in Colorado, including merlot,” said Doug Caskey, executive director of the CWIDB. No, I don’t know why he singled out merlot, but you can ask him. I appreciate Jeff’s remarks, since he’s attended several Drink Local Wine conferences and has a good idea of how the “other 47” are doing in their wine production. I just hope he doesn’t read my newspaper version of this column. Arrgghh. It’s Sunday, 95 degrees, and I’m recuperating from Colorado Wine Week. I missed a Colorado Wine Week post or two Friday and Saturday but really, I honestly have a good excuse. Winemaker Michelle Cleveland still shows her surprise and pleasure after her Creekside Cellars 2010 Colorado Cabernet Franc was named winner of the Colorado Wine Governor’s Cup competition. The wine won Double Gold for Best of Show and Best Bordeaux varietal. Friday night’s Day 6 Wine Week Challenge was the Governor’s Cup Awards presentation, and I opened (or had opened for me, which is even better), scads of tasty Colorado wines, including the Best of Show and Double Gold Cabernet Franc from Creekside Cellars. But important things first, right? Congratulations and a well-deserved high three (it’s a long story but how many fingers does Pluto have?) to Michelle Cleveland, talented winemaker and all-around great person for Creekside Cellars in Evergreen, for winning the 2013 Governor’s Cup Best of Show and Double Gold for her 2010 Cabernet Franc. Dark, luscious, lots of fruit and a judicious 24 months in Appalachian oak (she said it’s the same species of oak tree used to make French oak barrels) to balance. Too bad there’s not any left. Funny story: Michelle said she made 44 cases (that’s about 100 gallons or so) of the wine, which grew in the 10-acre Creekside vineyards in the Grand Valley, (Hey, almost all – 87 percent – of Colorado grapes grow in the Grand Valley) but had only 1 (one, uno, half of two) case left by the weekend. “I didn’t know how fast it would sell,” she said, but at least she had enough to share with the light intimate crowd at the Governor’s Cup Awards at Metro State University. Michelle really likes Colorado cabernet franc (the bottle’s label reads simply “Franc,” and underneath says “Colorado’s Cabernet”) and she and Kyle Schlachter of the Colorado Wine Industry Development Board have this plan to promote cab franc as Colorado’s best red grape. I’m all for it after tasting some of the excellent cab francs being produced by various Colorado winemakers. Curiously, the other double-gold medal Bordeaux-red winner this year also was a 2010 Cabernet Franc by Jackie Thompson of Bookcliffs Vineyards, and the 2012 Gov’s Cup winner was yet another cabernet franc, this one by the enigmatic Matt Cookson of the Winery at Holy Cross Abbey. “We’ve been making cabernet franc since we opened (2000),” said Michelle, who said she began as a beermaker before making the switch to fermenting grapes. And for those who are aware of this year’s tribulations in the vineyards (sounds like something Danielle Steel might write, eh? ), everyone I’ve talked with are saying (fingers crossed behind their back) their cab franc is one of the few vines to be healthy after the January freeze and the April frost. And remember 2010 was a light vintage, too, but Michelle had no problem wringing a Best of Show from the grapes. The rest of the Governor’s Cup winners are here, and among the top award-winners were Glenn Foster (Talon Wines); Jackie Thompson (Bookcliff Vineyards); Jay and Jennifer Christianson (Canyon Wind Cellars); and Matt Cookson (The Winery at Holy Cross Abbey). There were 225 wines submitted for the competition but Governor John Hickenlooper, who is a great supporter of Colorado wine, wasn’t able to make his usual appearance. After the awards, I headed over to Row 14, one of the Denver restaurants hosting the Sips & Snacks, pairing a glass of Colorado wine with a larger-than-an-appetizer but smaller-than-your-appetite plate. Row 14 was pouring the 2011 Two Rivers Winery Syrah and paired it with carnitas tacos. Good food, great wine, nice people, lots of fun. Lots.